The first four episodes of the new Game of Thrones season have leaked online a day before the official premiere. The leaked episodes, which appear to come from review copies sent to the press, have been downloaded more than 100,000 times in just three hours. 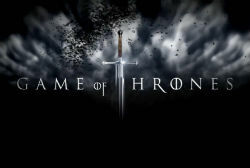 Starting a few hours ago several episodes of the new Game of Thrones season started to appear online. The copies were first spotted on the private torrent tracker IPT, but they soon made their way to more public sites such as The Pirate Bay, RARBG and KickassTorrents. At the time of writing the first four episodes of the new season have been posted online. One source informs TF that the leak most likely originates from review copies sent to the press. The leaks are a huge blow to HBO. In an effort to decrease piracy the company worked hard to ensure that the fifth season of Game of Thrones would premiere in 170 countries simultaneously. Today, however, pirates have scooped up the exclusive, releasing four episodes worldwide. While it came unexpected, many Game of Thrones fans have already spotted the early leak. During the first three hours the episodes were downloaded more than 100,000 times and this number is expected to increase to more than a million later today. The episodes that were posted online thus far are in standard-definition (SD) quality. Interestingly, some commenters note that they rather wait until HD copies become available, as they are used to watching the show in a better resolution. Over the past three years Game of Thrones has been the most pirated TV-show. Based on the popularity of today’s leaks, this will be no different in 2015. Update: After 18 hours there were more than a million downloads for the first episode. c There are 224 comments. Add yours?